A Satellite Pharmacy, Home Infusion Services and Uncompromising Laboratory Care. The Pharmacy department offers both inpatient and outpatient services that include Satellite Pharmacy and Home Infusion Services. Diagnostic testing is done in our Regional Laboratory, a state-of-the-art clinical and anatomical lab where diagnostic biopsies, gynecologic and non-gynecologic cytology preparations are interpreted and evaluated. Clinical testing is offered 24/7 with most in-house tests results in hours. Services include consultative and diagnostic interpretations in the fields of Hematopathology, Immunohistochemistry, Renal Pathology, Molecular, and Bone Marrow Pathology. The Regional Laboratory offers uncompromising client care for hospital inpatients, physicians, health insurers, and college and medical clinics. Donors make a difference in Pathology Lab and Pharmacy. 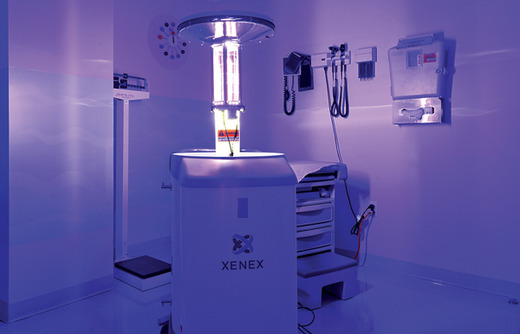 Ultraviolet disinfection technologies are now being used by an increasing number of hospitals that recognize that current cleaning practices are inadequate to protect the next patient. UV disinfection completes the disinfection process by disinfecting surfaces that are missed due to human error. The Germ Zapping Robot delivers fast, reliable room disinfection and is an effective way to destroy pathogens for a clean environment for patients. The robot emits high intensity bursts of light that efficiently disable pesky superbugs and microorganisms in five minutes or less for an extraordinary reduction in infections. Entirely funded through University Medical Center's Foundation, the Healing Arts Program integrates dynamic and inspirational art from local and regional artists in every area of the hospital including the Pathology Lab and Pharmacy, improving the hospital experience for patients, families and caregivers. Donors interested in more information on Pathology Lab and Pharmacy donor opportunities that impact our community's population can email donate@umcfoundationelpaso.org or click here to donate now. Foundation volunteers provide amenities and special support to Pathology Lab & Pharmacy patients and families. To learn how to become a volunteer, email volunteer@umcfoundationelpaso.org.